« R.I.P. Larry Hughes’ Career? Get Thee To The D-League! 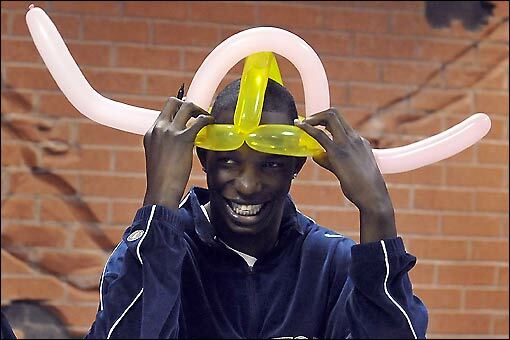 Hasheem Thabeet wears the traditional Tanzanian Cap of Shame. The Memphis Grizzlies are sending Hasheem Thabeet down to the D-League. Thabeet, the #2 draft pick last June, is the highest draft pick EVER sent down to the D-League. The previous highest pick sent to the D-League was 2005 #6 overall pick Martell Webster. But Webster came out of high school, so it made sense that he would need to spend some time in the minor leagues. Whereas Thabeet played three years of college ball for UConn. However, to be fair, Thabeet was born and raised in Tanzania and didn’t start playing basketball until he was fifteen. I don’t know. I mean, you get into one of these ‘On the one hand… on the other hand’ arguments and you can really drive yourself crazy. It really gets exhausting. How come nobody ever sent Darko down to the D-League? Can this still happen? I mean, like, can the Detroit Pistons send Darko down to the D-League? Is it too late? I feel like it shouldn’t be. Hmmm…. Let’s start an online petition. I’m gonna write my senator. Then I’m gonna write your senator. Then I’m gonna write ALL THE SENATORS! House of Representatives… YOU’RE NEXT!! !